While working with Excel, we are able to sum values that satisfy a given criteria by using the SUMIF function. 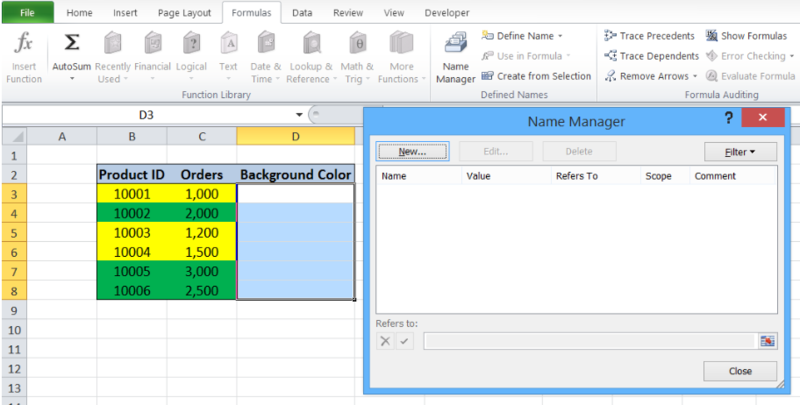 This step by step tutorial will assist all levels of Excel users in summing values in cells based on background color. Our table has three columns: Product ID (column B), Orders (column C) and a helper column Background Color (column D). Note that Product ID and Orders have preset background colors yellow and green. Cells F3 and F4 contain the two background colors yellow and green, which will serve as our criteria. We want to determine the sum of the orders based on the background color. We enter the results in cells G3 and G4. There’s no straightforward way to sum cells based on background color in Excel. For this example, the key is to assign a value for each background color, and use that value as the criteria for our SUMIF function. Step 2. Click the Formulas tab, then select Name Manager. This will launch the Name Manager dialog box. =GET.CELL(38,Sheet1!C3) in the Refers to bar. This formula returns the color number unique for the background color in the adjacent cell C3. Step 5. Click OK, then CLOSE. As a result, the value “6” is returned in cell D3, which is the color number for the background color yellow used in cell C3. Step 7. Copy the formula in cell D3 to cells D4:D8. Below figure shows column D that is filled with the corresponding color number for the background color in column C.
Step 8. Enter the color number for each background color in column F: In cell F3, enter the value “6” for yellow, while in cell F4, enter the value “10” for green. Step 4. Copy the formula in cell G3 to cell G4. The range we want to evaluate is D3:D8, which contains the number for the background color in column C. Our criteria in cell F3 is “6”, or the yellow color. We want to sum the orders in C3:C8 that satisfy the given criteria. The products that satisfy our criteria and have yellow background color are cells C3, C5 and C6. As a result, the sum of orders in cell G3 is $ 3,700. Copying the formula in cell G3 into cell G4 returns the value $ 7,500, which is the sum of orders with green background color.